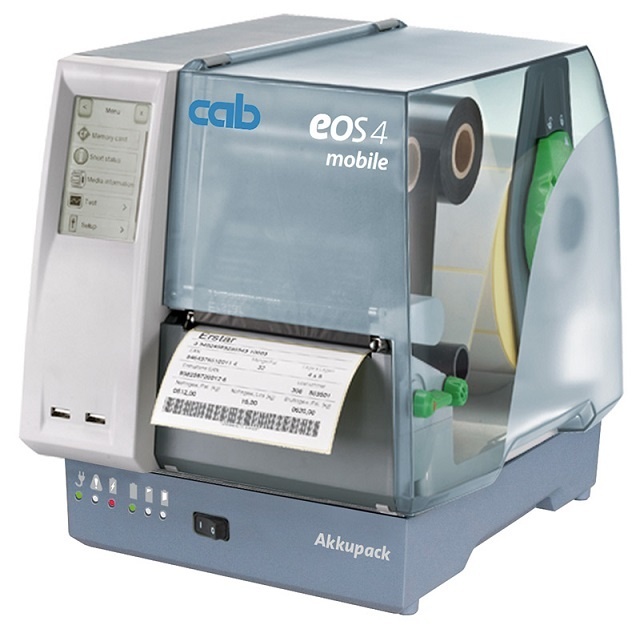 The new EOS series combines all functions of a solid label printer with highest ease of operation. The touchscreen LCD display is clearly designed for highest ease of use. EOS4 for label rolls up to 203 mm diameter. Further technical data are identical with EOS1. 1 Touchscreen LCD display Clearly designed for highest ease of use. 2 USB interfaces USB interfaces on the operation panel, 1 USB interface on the back for memory stick, service key, WLAN, bluetooth, keyboard and scanner. 3 Roll holder The label roll is inserted and centered automatically when closing the cover. 4 Ribbon retainer The stop is adjustable to the foil width. 5 Gap or reflective sensor The sensor position is adjustable by the red knob via a spindle. The set position is displayed with a LED. 6 Label guide Printhead The guides are adjusted to the material width with the green knob. 7 Printhead 203dpi or 300 dpi The printhead can be easily removed manually for cleaning or replacement. 8 Drive roller Drive rollerIt can be removed for cleaning or replacement without tools. As small labels may cause friction between printhead and print roller it is recommended to use in this case narrow print rollers with a width of 25, respectively 50 mm ensuring a better print image and extending the life of the printhead.